Documentation: Specimen: UNSM ZM10300, 7 May 1911 Lancaster Co.
Changes since 2000: Of nine accepted spring reports, six are during 2000-2014, suggesting an increase in Interior United States spring movement. Birders may also be scrutinizing flocks of waterfowl more closely and this may, at least partially, explain the increase in reports. 21 May 2010 Sarpy Co (eBird.org). An apparent immature male at Funk WPA, Phelps Co 6 May 2007 was possibly correct, but details were lacking. There are later reports of 1-4 from 4 Dec 1999 through 20 Jan 2000 at Lake Ogallala, 1-2 there 1-8 Jan 2011 including a juvenile male and an adult female on 2 Jan, and one at Lake McConaughy, Keith Co 2 Jan 2016. Good totals for a season were the 27 reported 11 Oct-25 Nov 2017, and the 25+ reported 12 Oct-25 Nov 2013. High counts: 9 at Branched Oak Lake, Lancaster Co 9 Nov 2007, 9 there 7 Nov 2009, and 9 at Capitol Beach Lake, Lancaster Co 28 Oct 2017. 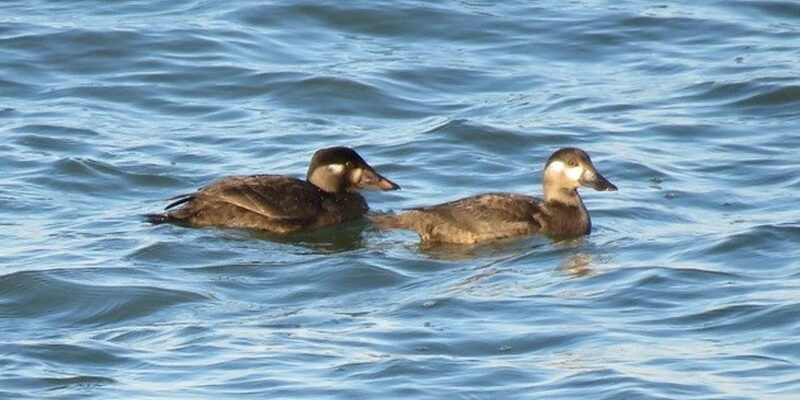 Photograph (top) of Surf Scoters at Lewis and Clark Lake, Knox Co 26 Oct 2018 by Mark A. Brogie.